Garlic was harvested about 80 bulbs were obtained. The main crop was grown from Rounds. A row of conventional planted cloves was grown to compare. 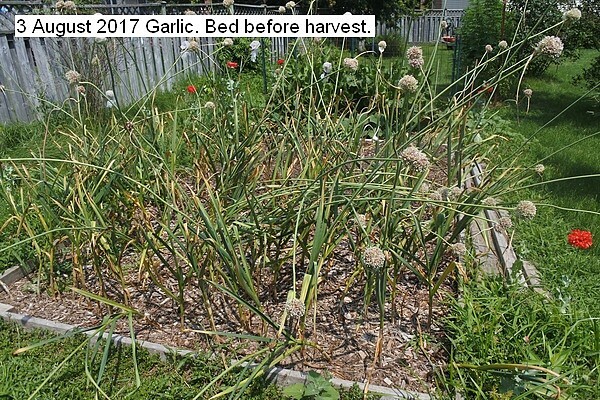 The conventional grown garlic is perceptually larger but probably not enough to justify using the main conventional crop for the following year’s crop. The scapes were left on and now removed. I don’t use the scapes and suspect leaving them on until harvest makes for slightly larger bulbs. Four seed scapes were left in the round to grow further to insure maturity. These will be used for producing rounds for next year. The rounds planted last year were trimmed and will be used for the main 2017/2018 crop. These were previously harvested. The crop was all healthy and no damage or disease was seen. The harvest could probably been delayed longer since the outer skin of the bulbs had not started to split. Delaying makes for larger bulbs depending upon weather and it has been found splitting of the skin appears to not effect storage time.